Read the recent Yale News article about Carla Horwitz's retirement from Calvin Hill. Read the New York Times article on Calvin Hill. Hear Carla Horwitz interviewed about the joys of starting a new school year, the future of early childhood education and how high quality child care contributes to a child's learning future. 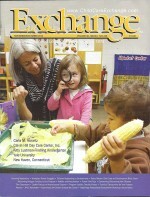 Read the recent cover feature in Exchange written by Carla Horwitz about the past and future of early childhood education and featuring photos from Calvin Hill.